Bundaberg, on the Coral Coast, is approximately a 4 hour drive north of Brisbane, within 15 minutes drive from the coast. 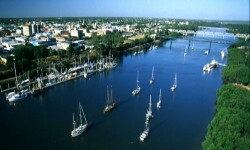 Bundaberg is the gateway to one of the wonders of the world - the Great Barrier Reef. Bundaberg is the southern most tip of the Great Barrier Reef. The Great Barrier Reef begins with coral reefs fringing the shoreline and two coral cay's: Lady Elliot and Lady Musgrave Islands. Reef walk, snorkel, dive and view one of the great wonders of the world - from Bundaberg. For visitors eager to explore the Great Barrier Reef, day trips and overnight stays depart from Bundaberg. Bundaberg City is a bustling provincial town, boasting beautiful heritage buildings mixed with modern architecture. Bundaberg is located in the heart of a rich sugar and horticultural belt supported by a sound manufacturing sector. In many parts of the world Bundaberg is readily identified with the sugar cane harvesters and famous Bundaberg Rum Distillery. The largest Loggerhead turtle rookery in the Southern Hemisphere is located at Mon Repos, just near Bundaberg. Places of interest near Bundaberg: The Hummock (extinct volcano), Bargara, Kelly's Beach, The Basin, Riverview, Elliott Heads, Innes Park, Palmers Creek, 1770, Moore Park Beach, Burnett River, Bundaberg Rum Distillery, Lady Elliot, Lady Musgrave Islands.